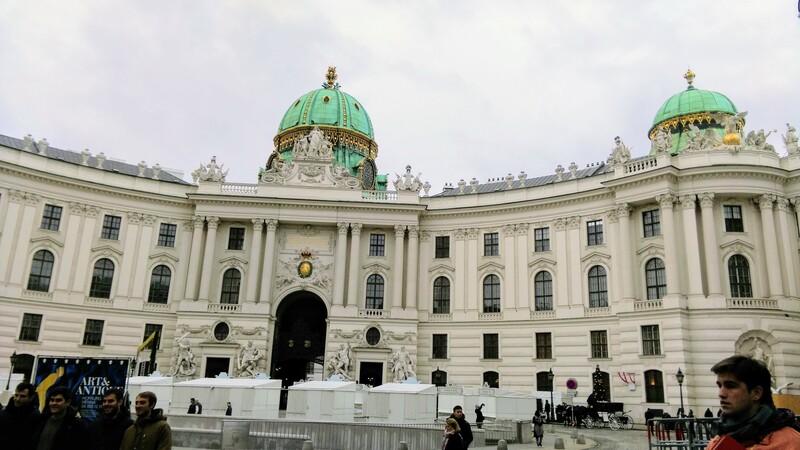 Hofburg, the former imperial palace of the Hapsburgs where they stay mainly in the winter. The palace had been built slowly adding expansions, such as the Royal Court Chapel, the Imperial Library, the Treasury, Burgtheater, and a Spanish Riding School long with stables and stalls. 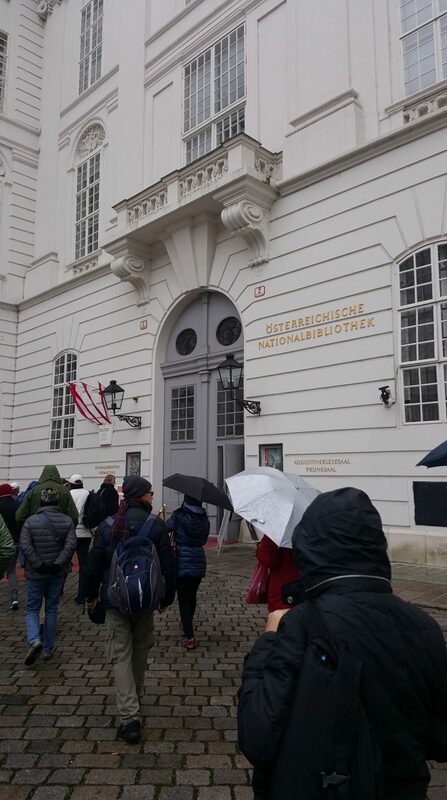 Today, it is also the official working office and residence of the President of Austria. The stables for the Spanish Riding School. Entrance to the most beautiful library. 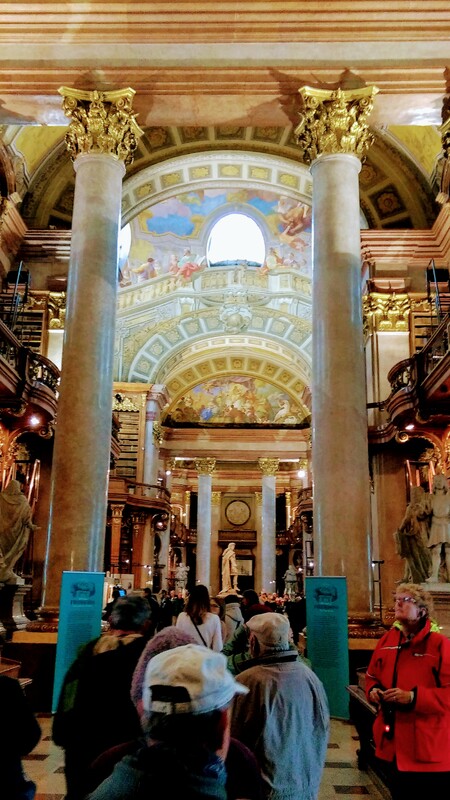 It was first constructed by Charles VI, the Holy Roman Emperor in 1722 to house the collection of all the valuable books and manuscripts collected since the Middle Ages. After the collapse of the Holy Roman Empire. 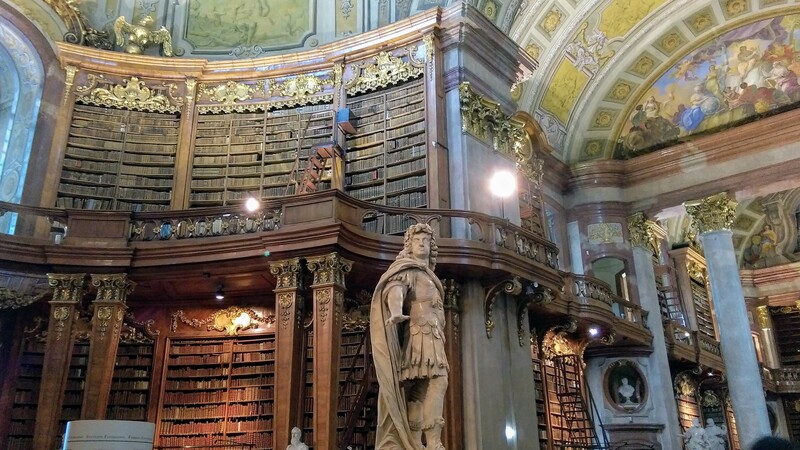 Under the Hapsburgs the library began to take on a new mission to be the place where information and knowledge could be sought and provided. It started to accumulate a wider field of the 19 century’s knowledge of science and topography as well as some rare literary works of foreign languages such as papyrus collection. 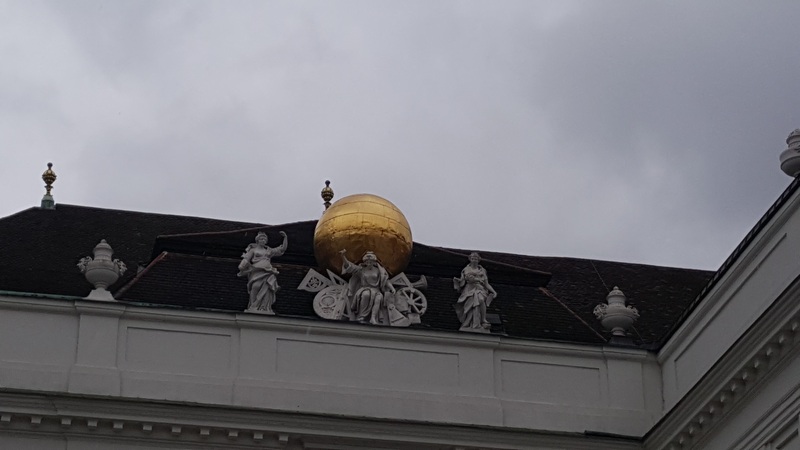 Its splendor signifies its importance to the Hapsburgs. Behind the statue, one can see every wall space was designed to store books and reading light provided by the windows upstairs. 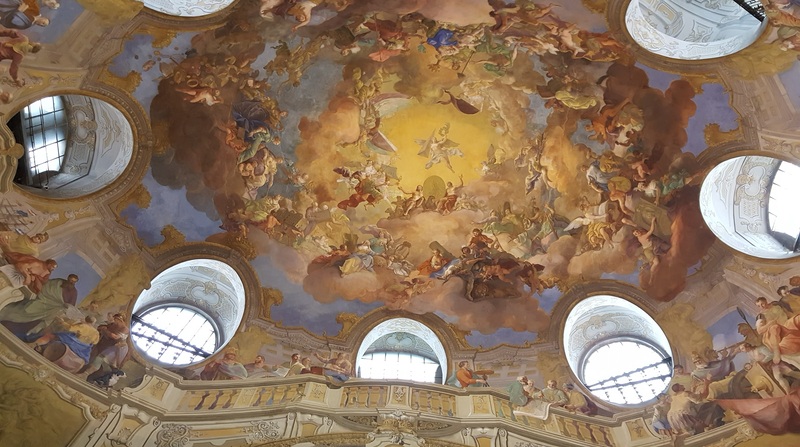 The center fresco of the dome is the glorification of Emperor Charles VI held up by Hercules and Apollo. 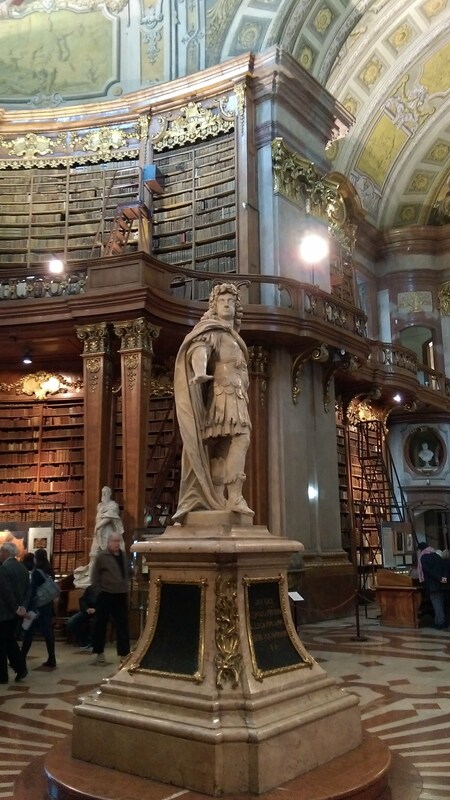 Surrounded by pictorial of Hapsburgs virtuous deeds, wealth and expanded domains. In between the windows are groups questing for various knowledge. On the arches above the columns are frescos about war and peace. See below. 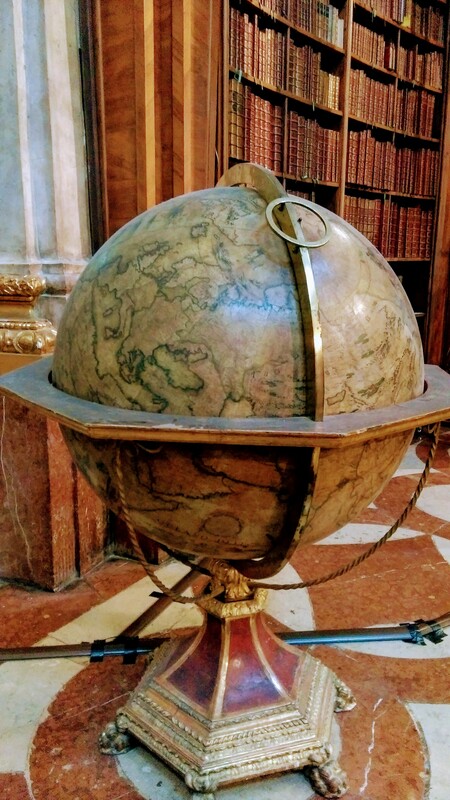 We now know there was a quest for knowledge but look at the Globe, we find that their knowledge then was limited. So is the theory of a “Just War” which only serve to justify war over peace. With what we know today, could there ever be a “Just War” without destroying the only earth we know off?